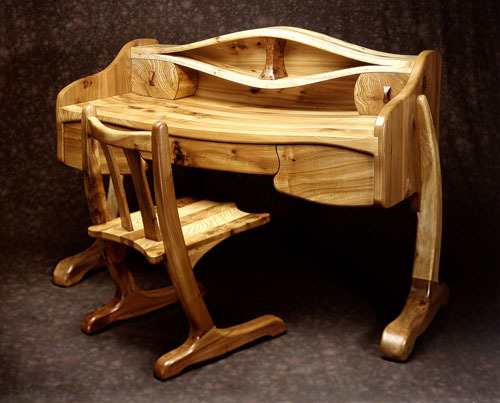 A curvaceous desk with strong lines and forms blended into a beautiful and tactile whole. This desk, standing poised on two sculpted legs, contains three concave- faced drawers under the shaped writing surface, and two rounded pen/oddment drawers tucked beneath the strikingly curved letter rack. The chair that comes with this desk is the #2 version of the Flow chair, and has a lower back to blend with and emphasise the lines of the desk.